Soak the beans overnight. This will greatly reduce the cooking time. 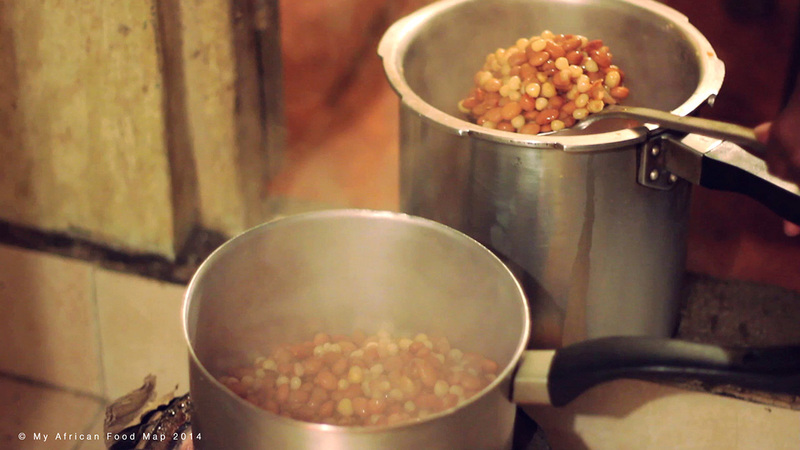 In this case, rinse the beans and put it together with maize kernels in a pot. Cook at a high temperature until both are soft. Add the oil and then the onions and cook for a few minutes before including the tomatoes. Crumble in the beef stock and add salt (if desired). Cook for 10 more minutes and serve. If you haven’t pre-soaked the beans, wash and put the beans in a pot of water and boil for about 3 hours/ until soft. Keep an eye on the water – it should always cover the beans. Check on the beans while they are boiling and when they’re almost soft, add the maize kernels. When both have cooked, transfer the contents into a new pot and add the other ingredients as directed above. “First of all, you have to pick out the stones and all dirty particles from the beans. So after picking off the stones from the beans, you have to wash the beans thoroughly because it has a lot of dust and a lot of soil. So you make sure that it’s totally cleaned out. You can either soak the beans for a few hours or you can directly put it on a cooking pot. So because the maize is soft, we have to put the beans first and then the maize. You add water I think, once or maybe twice and your githeri is ready. And, we cut onions and we also added a bit of oil; very little oil. The tomatoes will provide a bit of sauce. And now you just put on beef stock just to add some taste on it. Most people fry the onions and the tomatoes and then they add the githeri. But, in this method you just put the githeri and the tomatoes and the onions together, and you let it cook together so it blends nicely and gives you a very, very nice taste.